In the absence of effective drugs, controlling SARS relies on the rapid identification of cases and appropriate management of the close contacts, or effective vaccines for SARS. Therefore, developing specific and sensitive laboratory tests for SARS as well as effective vaccines are necessary for national authorities. 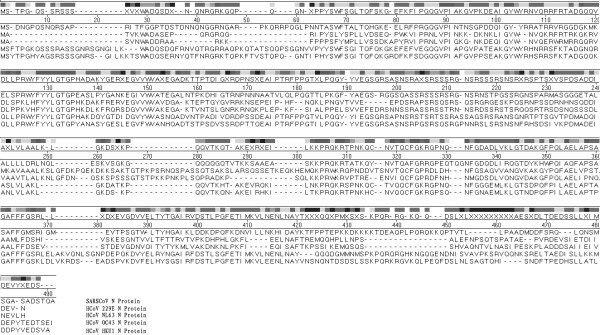 Genes encoding truncated nucleocapsid (N) and spike (S) proteins of SARSCoV were cloned into the expression vector pQE30 and fusionally expressed in Escherichia coli M15. The fusion protein was analyzed for reactivity with SARS patients' sera and with anti-sera against the two human coronaviruses HCoV 229E and HCoV OC43 by ELISA, IFA and immunoblot assays. Furthermore, to evaluate the antigen-specific humoral antibody and T-cell responses in mice, the fusion protein was injected into 6-week-old BALB/c mice and a neutralization test as well as a T-cell analysis was performed. To evaluate the antiviral efficacy of immunization, BALB/c mice were challenged intranasally with SARSCoV at day 33 post injection and viral loads were determined by fluorescent quantitative RT-PCR. Serological results showed that the diagnostic sensitivity and specificity of the truncated S-N fusion protein derived the SARS virus were > 99% (457/460) and 100.00% (650/650), respectively. Furthermore there was no cross-reactivity with other two human coronaviruses. High titers of antibodies to SRASCoV appeared in the immunized mice and the neutralization test showed that antibodies to the fusion protein could inhibit SARSCoV. The T cell proliferation showed that the fusion protein could induce an antigen-specific T-cell response. Fluorescent quantitative RT-PCR showed that BALB/c mice challenged intranasally with SARSCoV at day 33 post injection were completely protected from virus replication. The truncated S-N fusion protein is a suitable immunodiagnostic antigen and vaccine candidate. The epidemic of severe atypical pneumonia, designated "severe acute respiratory syndrome (SARS)" by the World Health Organization (WHO) and first observed in Guangdong Province of China in November 2002, affected 8422 people and caused 916 deaths in 33 countries and areas worldwide up to August 7, 2003 [1, 2]. A novel coronavirus, SARS-associated coronavirus (SARSCoV), was confirmed as the pathogen [3–6]. In the absence of effective drugs, controlling this disease relies on the rapid identification of cases and appropriate management of the close contacts, or effective vaccines against SARS. Therefore, the development of both specific and sensitive laboratory tests for SARS as well as effective vaccines is necessary for national authorities. Laboratory tests for SARS based on indirect immunofluorescence assay (IFA) or viral particle lysate enzyme-linked immunosorbent assay (SARSCoV lysate ELISA) to detect antibodies against SARSCoV are important methods . However, these methods both require cultivation of SARSCoV in a biosafety level 3 or 4 laboratory, which is both dangerous and difficult. Finding a suitable diagnostic test for this virus therefore remains a high priority. A practical approach towards this goal is to clone and express the immunodominant genes of SARSCoV. Several studies have shown that most of the antigenic epitopes of SARSCoV are located on the nucleocapsid (N) and spike (S) proteins and that the latter protein has an important role in viral entry and pathogenesis [8–12]. Other data have shown that the viral N and S proteins of coronaviruses could induce a specific T cell response [13–16]. Here, we report the cloning and expression of a truncated S-N fusion protein of SARSCoV and the investigation of its antigenicity and immunogenicity. The pQE30 vector was purchased from Qiagen (Qiagen GmbH, Hilden, Germany). Escherichia coli M15 was used as host strain for the vector. The following virus strains were kindly provided by the Academy of Military Medical Science and the National Institute for the Control of Pharmaceutical and Biological Products: The SARSCoV (BJ01); SARSCoV (GD01); human coronavirus 229E (HCoV 229E) and human coronavirus OC43 (HCoV OC43). All work with infectious virus was performed in a biosafety level 3 laboratory. Viral RNA was extracted with TRIzol according to manual (Invitrogen). All primers were synthesized by the Shanghai Sangon Company according to the published DNA sequences (table 1). Genomic SARSCoV sequences for N protein as well as for truncated N (321-422aa) and S (264-680aa) proteins were amplified by RT-PCR in a mixture of 200 μM (each) deoxynucleoside triphosphate, 0.3 μM (each) primer, 1 U of Taq polymerase (Takara) in 10 mM Tris-HCl buffer (pH 8.3) supplemented with 2.0 mM MgCl2 and 50 mM KCl. The PCR reactions were started with 10 min at 95°C and followed by 35 cycles, with 1 cycle consisting of 45 sec at 94°C, 30 sec at 55°C, and 60 sec at 72°C. A final step of 5 min at 72°C was added to the last cycle. The fusion gene construct was established for expression of a truncated S-N fusion protein. The recombinant plasmids were constructed as described elsewhere . All restriction enzymes and ligases were purchased from TaKaRa biotechnology Co., Ltd (Dalian, China). E. coli M15 was transformed with ligation mixtures and the control vector, respectively. The presence of the target genes in the recombinant plasmids was verified by gene-specific PCR and sequence analysis. a f and r signify forward and reverse primers, respectively. b underlined sequences indicate restriction sites: Bam HI (ggatcc), Pst I (ctgcag), Sal I (gtcgac), Hin dIII (aagctt), and Kpn I (ggtacc). The materials and methods used for obtaining the recombinant proteins were described in detail elsewhere . The transformed bacteria were induced with 2.0 mM IPTG at 37°C and inclusion bodies containing recombinant proteins with N-terminal sequences of six consecutive His residues were serially extracted with 2 M urea and then dissolved in 8 M urea. It was then subjected to purification by means of a Ni-NTA Affinity Chromatography Purification Kit according to manual (Qiagen GmbH). Recovery of purified and renatured recombinant proteins from the denatured state in 8 M urea in buffer A (10 mM Tris-Cl (pH 7.0), 100 mM NaH2PO4) was achieved by sequential dialysis against 6 M, 4 M and 2 M urea in buffer A and finally against buffer A only. In detail, the products were dialyzed twice against 5 volumes of 6 M urea in buffer A for 30 min at room temperature. The same procedure was repeated with 4 M urea and 2 M urea in buffer A. The final dialysis was against buffer A with two initial changes of buffer after 30 min each and a final dialysis overnight at 4°C. The purity of the target proteins was determined by SDS-PAGE , see Figure 1. SDS-PAGE analysis of the expression and purification target proteins. Lane 1: purified HCoV 229E truncated N protein; Lane 2: purified SARSCoV truncated N protein; Lane 3: purified HCoV OC43 truncated N protein; Lane 4: purified HCoV 229E N protein; Lane 5: purified SARSCoV N protein; Lane 6: purified HCoV OC43 N protein; Lane 7: purified SARSCoV truncated S-N fusion protein; Lane 8: purified SARSCoV truncated S protein; Lane M: protein molecular weight marker. SARS patients' sera: 460 serum samples from SARS convalescents (from 35 to 114 days after the onset of illness) fulfilling the clinical WHO case definition of SARS, and whose diagnosis was subsequently confirmed by seroconversion, were collected in 301 Hospital (Beijing, China) and 302 Hospital (Beijing, China). All sera were tested positive by the SARSCoV lysate ELISA IgG Kit (Beijing BGI-GBI Biotech Corp.), which has been approved by the State Food and Drug Administration (SFDA) for the detection of anti-SARSCoV immunoglobulin (Ig) G antibody from human serum or plasma specimens. Sera from 650 Healthy blood donors were collected by the Beijing Red Cross blood center from May to October 2003. Polyclonal mouse sera against SARSCoV (BJ01), HCoV 229E and HCoV OC43 were prepared in our laboratory (IFA dilution: 1:5120, 1:5120, 1:10240, respectively) as were polyclonal mouse sera against purified recombinant proteins SARSCoV N, HCoV OC43 N, HCoV 229E N (IFA dilution: 1:5120, 1:2560, 1:5120, respectively). Control sera were collected from healthy BALB/c mice. Mouse immunization was performed according to established protocols . Briefly, sixteen 6-week-old BALB/c mice were divided into 2 groups and injected subcutaneously with 0.1 mL of purified recombinant fusion truncated S-N protein solution (100 μg/mL) and PBS, respectively, both mixed with an equal volume of paraffin oil. Immunized mice were boosted after 24 days using the half dose of antigen by celiac arterial route. An immunoblot analysis was performed as described in detail elsewhere . SDS-PAGE analysis was performed using the Mini-protein 3 Electrophoresis System (BIO-RAD). The stacking gel and separation gel contained 5% and 15% acrylamide, respectively. Electrophoresis was carried out at a constant voltage of 120 V for 180 min. The proteins were electroblotted onto nitrocellulose membranes. The mouse sera were then tested against each of the recombinant proteins. 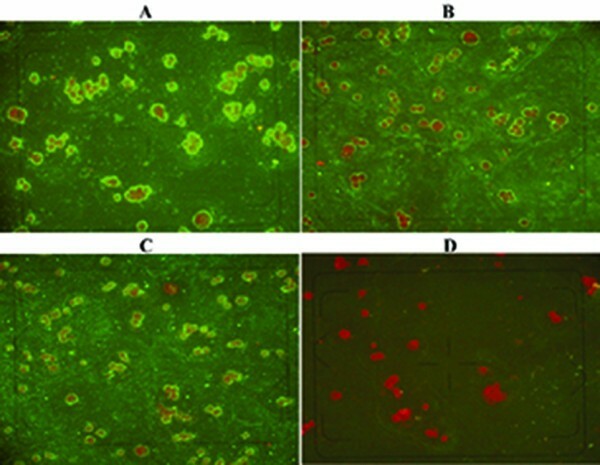 An indirect immunofluorescence assay (IFA) was performed to detect antibodies to SARSCoV (BJ01), HCoV 229E and HCoV OC43 by using SARSCoV according to established protocols . Microtiter plates (96 wells, Shenzhen Jinchanhua Co. Ltd) were coated overnight at 4°C with either of the eight recombinant antigens (four recombinant antigens of SARSCoV: truncated S protein, N protein, truncated N protein, and truncated S-N fusion protein; two recombinant antigens of HCoV 229E: truncated N protein, N protein; two recombinant antigens of HCoV OC43: truncated N protein, N protein) diluted in 50 mM NaHCO3 buffer (pH 9.6). Each well was rinsed with PBS (phosphate-buffered saline) containing 0.05% Tween-20 and 3% BSA for blocking the remaining protein-binding sites. After incubation at 37°C for 1 hour, the plates were washed five times with the PBS/Tween-20 buffer. Diluted serum samples (1:10 with PBS) were added to the plates. The plates were incubated at 37°C for 30 min and washed five times with the PBS/Tween-20 buffer. 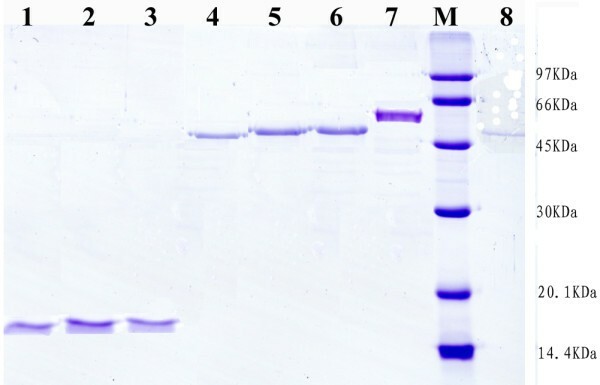 After addition of peroxidase-conjugated goat anti-human IgG (diluted 1:2000 in PBS supplemented with 0.5% of Tween-20 and 1.5% of BSA) to each well and the plates were incubated at 37°C for 30 min, then washed five times with the PBS/Tween-20 buffer before the addition of tetramethyl-benzidine (TMB)/hydrogen peroxide substrate. Reaction was stopped by addition of 2 M H2SO4. The OD450/630 value was measured with a microtiter plate reader in triplicates. A blank control, a negative control and a positive control were always included on each plate. The cut-off values for IgG were 0.16 (three N proteins), 0.12 (truncated S protein), 0.14 (three truncated N proteins), 0.12 (truncated S-N protein), respectively, which were calculated as the mean + 2 SD of the readings given by 1000 blood donor control sera collected from 2001 to 2002 in Beijing. Samples were tested again in triplicates when their OD450/630 values were near the cut-off values. For the detection of mice antibodies, all procedures were the same as for detection of human antibodies except that peroxidase-conjugated goat anti-mice IgG diluted to 1:1000 was used. Mice sera were diluted to 1:20 with PBS. Neutralizing titer (NT) of mouse sera was measured by a rapid microneutralization assay . In brief, heat-inactivated (55°C for 30 min) mouse immune serum was diluted tenfold and then serially diluted twofold to 1:2560 in DMEM (Gibco) containing 5% heat-inactivated fetal calf serum (56°C for 30 min). Approximately 50 μL of SARSCoV (BJ01 strain) (400 TCID50/100 μL) was mixed with an equal volume of diluted serum and incubated at 35°C for 1 h; then 50 uL of the mixture (containing 100 TCID50) and 50 μL of DMEM containing 5% inactivated fetal calf serum were added onto a VeroE6 cell monolayer in triplicate. The viral cytopathic effect (CPE) was observed on days 2 and 3. The dilution of serum that completely prevented CPE in 50% of the wells was calculated according to the Reed Muench formula . Serological cross-reactivity among different human coronaviruses was tested by incubation of SARSCoV-infected cells with mouse antisera against the two other human coronaviruses, HCoV 229E and HCoV OC43, and subsequent indirect immunofluorescence assay (IFA). To evaluate cross-reactivity among different recombinant proteins of the three human coronaviruses, the proteins were subjected to immunoblot assays with mouse antisera against the proteins as well as antisera against the viruses and were also subjected to ELISA with 460 serum samples from SARS convalescents as well as mice antisera against the viruses. Serum samples were collected from the tail veins every 3 days after the initial immunization and the final serum samples were collected from the orbital plexus for antibody level assessment by the SARSCoV lysate ELISA IgG Kit according to the manufacturer's instruction, except that peroxidase-conjugated goat anti-human IgG was substituted by peroxidase-conjugated goat anti-mouse IgG (Sihuan Sci-Technics Company, Beijing). A value of S/N ≥ 2.1 was taken as positive standard. The proliferation of spleen lymphocytes was measured by colorimetric analysis described previously . Four BALB/c mice in each group were killed on day 33 after immunization and their spleens were ground into single-cell suspensions in RPMI 1640 medium (Gibco) supplemented with 10% fetal calf serum. The suspensions were mixed with 5 volumes of erythrocyte lysis buffer (0.01 M Tris-HCl pH 7.6; 0.01 M NaCl; 0.005 M MgCl2), incubated for 10 minutes on ice and centrifuged at 400 g for 5 min at 4°C. The pellets were resuspended in RPMI 1640 medium (Gibco) supplemented with 10% fetal calf serum. They were seeded in triplicates in flat-bottom 96-well microtiter plates (Costar) with 5 × 105 cells per well in 100 μL of culture medium with purified and truncated S-N protein at 10, 3, 1, 0.3 and 0 μg/mL, respectively. After incubation for 3 days with 5% CO2 at 37°C, 10 μL of a solution of the tetrazolium salt 3-(4,5-dimethylthiazol-2-yl)-2,5-diphenyltetrazolium bromide (MTT) was added to each well, and the plates were incubated for 4 h at 37°C. One hundred microliter of lysis buffer containing 10% Triton-50% isopropanol-0.01 M hydrochloric acid was then added to each well, and the plates were incubated overnight. The optical densities at 570 nm (OD570) and at 630 nm (OD630) were measured. Four BALB/c mice from each group, immunized as well as controls, were challenged intranasally with 104 TCID50 of the SARSCoV GD01 strain on day 33 after immunization to tested the heterologous protection. After two days of clinical observation the mice were sacrificed and their lungs were collected for determination of the level of viral RNA. Fifty mg lung tissue was first homogenized in liquid nitrogen and then in 1 mL of TRIzol. Tissue homogenates were clarified by low-speed centrifugation (3000 rpm). RNA extraction was performed according to manual (Invitrogen). Virus loads were determined by fluorescent quantitative RT-PCR and expressed as number of copies per gram tissue . The result of immunofluorescence analysis of cross-reactivity between SARSCoV-infected cells and mouse antisera against each N protein of the three coronaviruses is shown in Figure 2. The results show that mouse anti-sera to HCoV 229E N protein and HCoV OC43 N protein cross-react with SARSCoV. Figure 3 shows the result of immunoblot analyses for cross-reactions between (i) intact N protein from the three human coronaviruses plus the truncated S protein and mouse antisera against each coronavirus (panels A, B, and C) and (ii) truncated N protein from each coronavirus and mouse antisera against each coronavirus (panels D, E and F). The results showed (a) cross-reactions between the intact N proteins and the antisera against the three coronaviruses and (b) no cross-reaction between the antisera and the truncated proteins. The recombinant proteins of HCoV 229E and HCoV OC43 were also tested with 460 serum samples from SARS convalescents by ELISA. The results showed 34 and 21 sera were tested positive by N proteins of HCoV OC43 and HCoV 229E respectively, while none of the sera were tested positive by both truncated N proteins of HCoV OC43 and HCoV 229E. Immunoblot assay analysis of cross-reaction of the coronaviruses recombinant proteins using mouse anti-sera to three different human Coronaviruses and recombinant proteins. 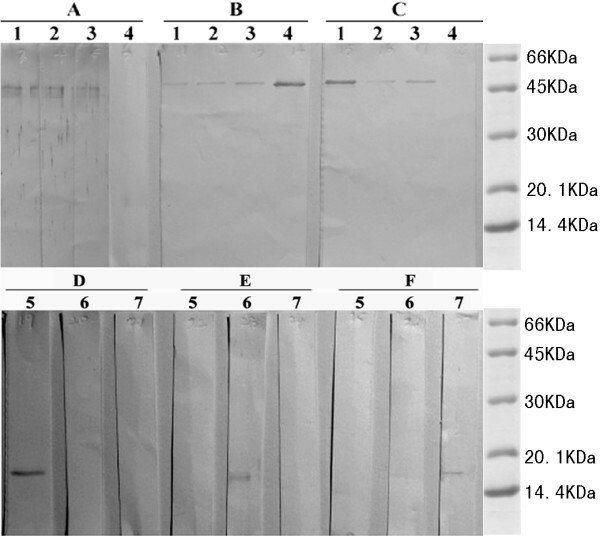 A: Reacted with mouse anti-serum to HCoV229E; B: Reacted with mouse anti-serum to SARSCoV; C: Reacted with mouse anti-serum to HCoVOC43; Lane 1: Purified HCoV229E N protein; Lane 2: Purified HCoVOC43 N protein; Lane 3: Purified SARSCoV N protein; Lane 4: Purified SARSCoV truncated S protein; D: Reacted with mouse anti-serum to SARSCoV; E: Reacted with mouse anti-serum to HCoV229E; F: Reacted with mouse anti-serum to HCoVOC43; Lane 5: Purified SARSCoV truncated N protein; Lane 6: Purified HCoV229E truncated N protein; Lane 7: Purified HCoVOC43 truncated N protein. The qualities of truncated S protein, N protein, truncated N protein and truncated S-N fusion protein as diagnostic antigens were evaluated by ELISA technique as described in Materials and Methods. All 460 SARS patients' sera were tested against all four antigens. Only 3 samples were tested negative in the truncated S-N fusion protein assay, whereas 62, 38 and 43 samples were tested negative in the truncated S protein, N protein and truncated N protein assays, respectively (Table 2). Compared with SARSCoV lysate ELISA, the sensitivity of ELISA with truncated S protein, N protein, truncated N protein and truncated S-N fusion protein as antigens were 86.5% (398/460), 91.7% (422/460), 90.7% (417/460) and > 99% (457/460), respectively. To evaluate the specificity of these assays, the sera of the 650 healthy people were tested. Only a few gave a positive reaction with either SARSCoV lysate or N protein, whereas none reacted against the truncated proteins (Table 2). To further evaluate the specificity of the truncated S-N fusion protein, the polyclonal mouse sera against SARSCoV (BJ01), HCoV 229E and HCoV OC43 antisera to were tested by ELISA. Only mice antiserum against SARSCoV(BJ01) tests positive. Antibody detection rates for recombinant protein ELISA and SARSCoV lysate ELISA of sera from SARS patients and healthy controls. The lymphocytes proliferation assay showed that the truncated S-N protein could induce T cell proliferation of mice immunized with the truncated fusion protein (Table 3). There are significant differences between mice immunized with the truncated fusion protein and the controls (t test p = 0.0084 < 0.05). a Four BALB/c mice of each group were killed. Spleens were harvested and lymphocyte cultures (Three repeats) were stimulated in vitro for 3 days with medium or with various concentrations of purified recombinant fusion truncated S-N protein (three repeats). The truncated S-N protein could induce T cell proliferation and significant differences were found between the groups of mice immunized with recombinant protein or injected with PBS (T test P = 0.0084 < 0.05). No clinical signs of illness were observed in either group of SARS-challenged mice. The analysis for SARSCoV genome copies in the lungs of immunized mice and controls was performed. The mean of virus genome copy numbers are 20708 ± 6202 (copies/g ± SD) per 1 gram lung tissue in the control group, whereas virus loads in mice immunized with truncated S-N protein were below the limit of detection. SARS, a newly emerged infectious disease which caused worldwide outbreak in 2003, has been a crucial public health problem. Establishing specific and convenient laboratory tests for SARS and finding a vaccine for this virus are of high priority. Previous data have shown a high degree of sequence similarity between the nucleocapsid (N) proteins of coronaviruses and demonstrated serious serological cross-reactions [25, 26]. We aligned the N protein of five human coronaviruses (SARSCoV, HCoV 229E, HCoV NL63, HCoV OC43 and HCoV HKU1) and found several fairly homologous regions, e.g. SARSCoV 57-210aa, 258-320aa. In these regions, the N protein of SARSCoV is 35–39% identical in amino acid sequence to the N protein of HCoV 229E and HCoV NL63 and 47–50% identical in amino acid sequence to that of HCoV OC43 and HCoV HKU1 (Figure 4). We also found that the C-terminal of the N protein (SARSCoV 321-422aa) has lower identity in amino acid sequence among these human coronaviruse (Figure 4). In addition, our previous research showed that some unique highly antigenic sites are located in the C-terminal part of the SARS N protein and in the 270-667aa of the SARS spike (S) protein . Other research also showed that the C-terminal part of the SARS N protein was highly antigenic . In the present study, using the pQE30 expression vector we cloned the N genes, gene segments encoding the C-terminal parts of the N proteins from all three coronaviruses, as well as SARSCoV gene segments encoding a truncated spike protein (264-680 aa) and a truncated S-N fusion protein, respectively. All proteins were highly expressed in E. coli M15. To evaluate the cross-reactivity of these recombinant proteins and viruses, IFA and immunoblot assays were performed. The results (Figures 2 and 3) showed that the truncated proteins only reacted with species-specific antiserum while the N proteins cross-reacted as did the viruses. The further ELISA results also showed that the intact N proteins of HCoV 229E and HCoV OC43 cross-reacted with SARS patients' sera (21/460, 34/460 respectively) while the truncated N proteins did not cross-react with SARS patients' sera. Sequence alignments of N proteins of SARSCoV , HCoV 229E, HCoV NL63, HCoV OC43 and HCoV HKU1 by Clustal V Method with MegAlign. Using the purified proteins as antigens in ELISA assays for antibodies in the sera of SARS patients we found that the assay using truncated S-N fusion protein has a clearly higher sensitivity than those using intact N protein or truncated S and N proteins, and virtually as high as the assay using whole SARSCoV lysate (Table 2). The results indicated the N and S protein were complementary in detecting SARS-specific antibodies. This is consistent with previous studies [28, 29]. Five positive sera to SARSCoV lysate antigen were all tested positive against SARSCoV N protein but negative against SARSCoV truncated N-S protein. These sera were also tested positive against N proteins of HCoV 229E and HCoV OC43 (data not shown), which could be reasonably explained partly by existence of other HCoV infections in these humans. The truncated S-N fusion protein was also subjected to ELISA with mice antisera against SARSCoV (BJ01), HCoV 229E and HCoV OC43. Only mice antiserum against SARSCoV(BJ01) tests positive. These results showed that the SARSCoV truncated N-S protein had high specificity. Considering the difficulty of SARSCoV lysate antigen production and its false positive ratio (~0.77%, Table 2), the truncated S-N fusion protein is a suitable diagnostic antigen for detection of SARSCoV antibodies. The S protein of SARSCoV is an important determinant of tissue tropism, as it mediates virus and cellular membrane fusion. Analysis of neutralizing epitopes showed that the receptor-binding region of the S protein plays an important role in virus infection [12, 30, 31]. A DNA vaccine study of SARSCoV has also shown that the S protein can induce protective immune responses to SARSCoV . Moreover, some data showed that the N protein of SARSCoV could induce specific T-cell responses and studies of animal coronaviruses have suggested that both cellular and humoral immunity contribute to protection during persistent infection [13, 16, 33]. Considering that our fusion protein includes the receptor-binding region of the S protein and immunodominant T-cell epitopes of the N protein, we also investigated the role of the truncated S-N protein in anti-SARSCoV infection. Seven to nine days after injection of the fusion protein, the mice began to show seropositive for SARS antibodies. After the first booster, all mice generated high titer of SARS-specific antibodies and the antibodies could neutralize the SARSCoV infectivity. In the lymphocytes proliferation assay, the truncated S-N protein could induce T cell proliferation (Table 3). Compared to the control group, the mice immunized with the truncated S-N protein were protected from SARSCoV challenge, as indicated by a lack of detectable viral RNA. Therefore, in addition to being a valuable diagnostic antigen the truncated S-N fusion protein is a potential candidate for the development of a SARS subunit vaccine. The truncated S-N fusion protein has high sensitivity and specificity and it is a suitable diagnostic antigen for detection of SARSCoV antibodies. On the other hand, it could induce the mice generated high titer of SARS-specific neutralizing antibodies and T cell proliferation. The mice immunized with the truncated S-N protein were protected from SARSCoV challenge. It is also a potential candidate for the development of a SARS subunit vaccine. Feng Mu, Dongsheng Niu, Jingsong Mu contributed equally to this work. We thank Drs. Xiuqing Zhang critical reading of the manuscript. We thank research funding from the National High Technology Research and Development Program of China (863 Program) 2003AA208216 from Ministry of Science and Technology, the People's Republic of China and from Chinese Academy of Sciences. FM carried out the genes cloning and protein expression and drafted the manuscript. DSN carried out the Viruses challenge assays and partial immunoassays. JSM carried out clinical samples collection and partial immunoassays. BH, WGH, SYH and BY participated in the samples detection. BXF and YQ participated in the samples collection. WJC designed the study, perform the data analysis and wrote the manuscript. All authors read and approved the final manuscript.